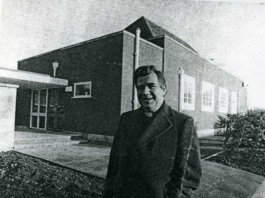 Here is a picture of St Joseph’s taken in the early days at Chance Street, not long after the building transformed, in 1977, from a telephone exchange to our place of prayer and worship. 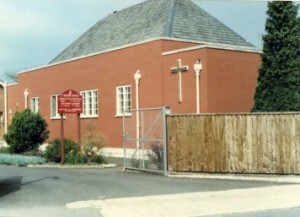 Previously, between 1870 and 1977, many Catholics in Tewkesbury had used the church on the hill at the Mythe which had been built by the Marquis de Lys (and was actually a conversion from a block of stables). A full and interesting history of the parish, compiled in 2005 by Father Richard Barton is available in the church office. Above we have a photograph of Father Larkin who was parish priest at the time of the move. 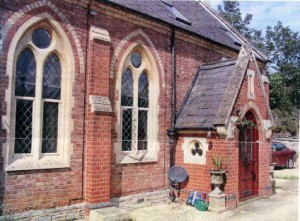 He lived in various local cotages after the sale of the Mythe property, but left before the new presbytery in Chance Street had been completed and was replaced as parish priest by Father Stirrat. Part of the Borough Council’s planning consent for the Chance Street property involved landscaping the site. This was started in the early 1980’s – a decade that also saw the completion of the covered annexe (Narthex) and the installation of coloured glass windows in the sanctuary. In 1990 Bishop Mervyn Alexander visited to bless four further new windows in the nave and to re-hallow the Victorian Pearce-Serocold window in the Narthex, which attracted quite a lot of media attention when it belatedly followed the parishioners down from the Mythe. The window shows the moment when the Archangel Gabriel announces to Mary that she was to be the mother of Jesus. It had been donated in 1888 by Mrs Amelie Pearce-Serocold, in memory of her husband . The original cost of the window, installation, transportation, workmen’s wages etc in 1888 was £42. Restoration and transfer to Chance Street in 1990 cost the parish £8,500. In the early 1990’s Dr Michael Saunders, as parish priest, had a religious mural painted on the sanctuary wall, a concept inspired by a similar mural commissioned y the Ursuline sisters for one of their convent chapels. A glazed tympanum, depicting the seven sacraments, was installed in 1996 and a set of fine, carved, wooden stations of the cross, possibly from Oberammergau, were also installed during this period. In September 2004, Father Richard Barton was appointed parish priest and, following some serious consideration towards building a new church and a review of the existing building, it was decided to remain in Chance Street and the garden and grounds were considerably improved. 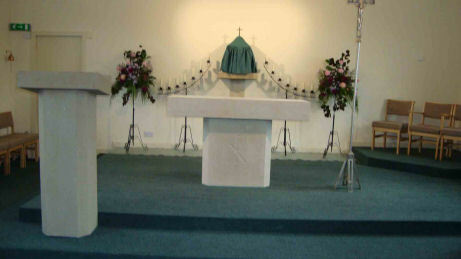 In 2013, under the guidance of Canon Richard Dwyer who soon afterwards moved to Weston super Mare and was replaced by Father Peter Slocombe, the church and a new stone altar and refurbished sanctuary were dedicated by Bishop Declan Lang. Looking back over more than a century of history, the people of the parish of St Joseph’s can be rightly proud of their beautiful church. The hard work, vision and financial support of many generations has made possible this great journey to where we – the church – are today. Click on the links below to open up interesting documents concerning the more ancient history of our parish and some of the original ‘movers and shakers’ who we can be grateful to for a Catholic presence in the town of Tewkesbury.